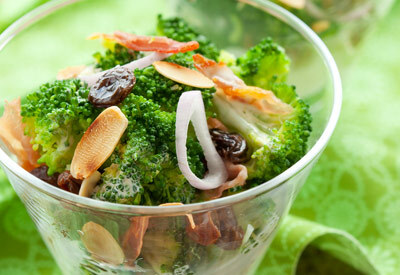 Add broccoli, onion, toasted almonds, raisins and cooked bacon to a large mixing bowl. In medium mixing bowl combine sugar, vinegar and mayonnaise; mix well. Pour over broccoli and other ingredients and toss to coat. Chill for 1 hour to blend flavors. Divide into six individual serving dishes and serve immediately.